No. 280 anchored the impressive row of limestone rowhouses. As the 19th century drew to a close Harlem had developed from a rural area of small farms to a suburb of New York City whose streets and avenues were lined with homes, churches and businesses. The extension of the elevated railroad in 1880 made the area accessible and developers responded to its potential with blocks of brick and stone speculative rowhouses. 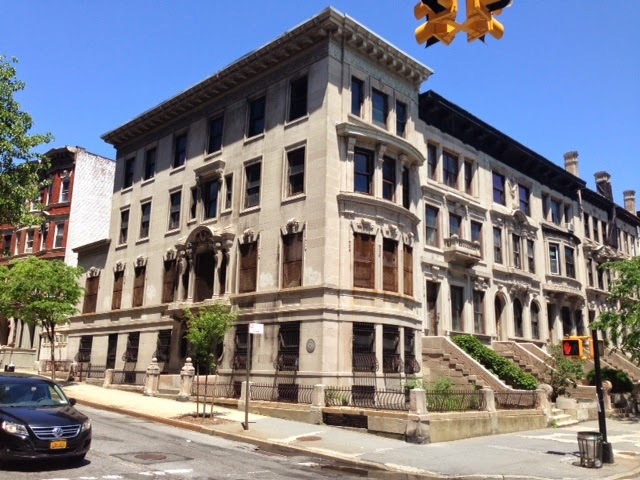 In 1899 architect Henri Fouchaux designed ten harmonious limestone houses on Convent Avenue in the Morningside Heights section for speculators Hyman and Henry Sonn. The pair originally had approached F. C. Zobel to design the row. Zobel’s plans called for wider homes (resulting in eight rather than ten). The projected cost of construction was $15,000 each—about $407,000 today. That price was perhaps a bit too rich for the Sonns’ taste and they called in Fouchaux. His proposed row, filling the block from 141st to 142nd Street, would be high-end residences as well; yet would cost nearly half as much at $8,000 apiece. Fouchaux designed them as a mirror-image set. The five homes from the 141st Street corner to the middle were each different but complimentary. Then the pattern reversed itself—the sixth residence matched the fifth next door, the seventh matched the fourth, and so on until the two corner homes served as the show-stopping bookends. The row was officially completed on January 31, 1902. The two end homes turned their backs to the row, opening on to the streets while retaining the Convent Avenue addresses. No. 280, at the southern end of the string, pretended to be nothing less than a mansion. It sat imperiously back from the sidewalk, surrounded by an areaway protected by a stone and metal fence. The façade featured the scrolls and carvings expected in a Beaux Arts structure; yet Fouchaux handled the ornamentation with reserved dignity. It appears that No. 280 was first owned by James J. Phelan. In 1901 he applied for a reduced assessment because of the “paving with asphalt pavement” of Convent Avenue that ended at 141st Street. In 1906 the City College of New York had completed its striking Collegiate Gothic campus directly to the south of No. 280 Convent Avenue. A year later, on August 25, 1907 the Phelans were apparently packing up and considering selling the mansion. An advertisement in the New-York Tribune that day sought a caretaker “by married couple, one child; care of private house for sale or during family’s absence; experience; with first class city reference from present employer.” Applicants were instructed to contact Mrs. Phelan at the service address, No. 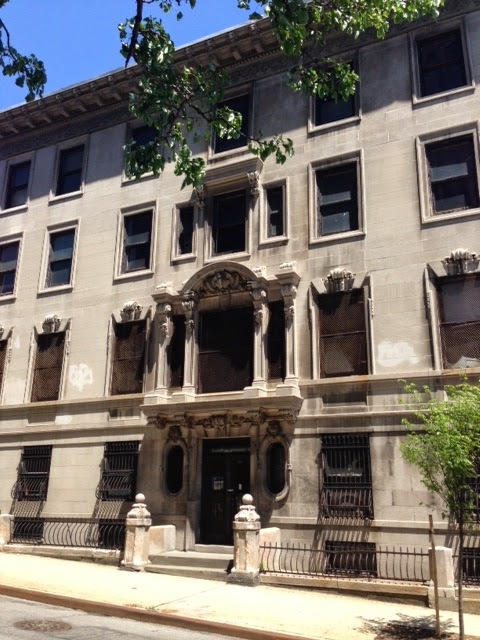 451 West 141st st. The house was purchased by the City for $39,000 “For the use of the College of the City of New York as an addition thereto.” By 1911 it was home to Herbert R. Moody and his wife, the former Edna Wadsworth. Moody was Professor of Chemistry at the college and had been director of chemistry laboratories since 1905. 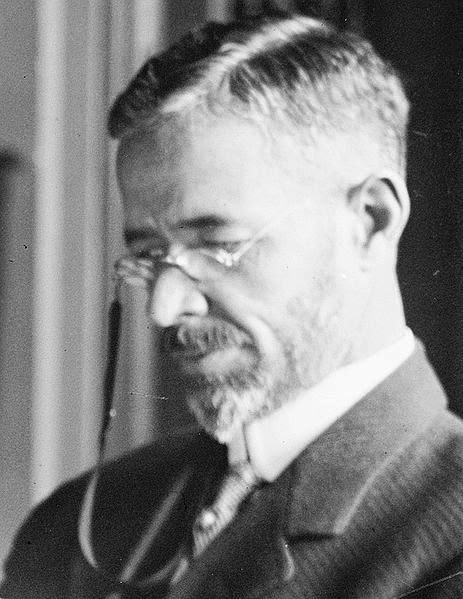 Dr. Moody would later serve as chief of the technical branch of the chemical division of the War Industries Board during World War I. But before that came to pass, the College spent $4,500 to renovate the house in 1915 as the official residence of President Sidney Edward Mezes, appointed the year before. Three years later the Board of Estimate and Apportionment approved a budget of $2,600 for painting buildings at the college, including the President’s house. Whether Mezes ever, indeed, was forced to pay rent is unclear. Following his departure in 1927 No. 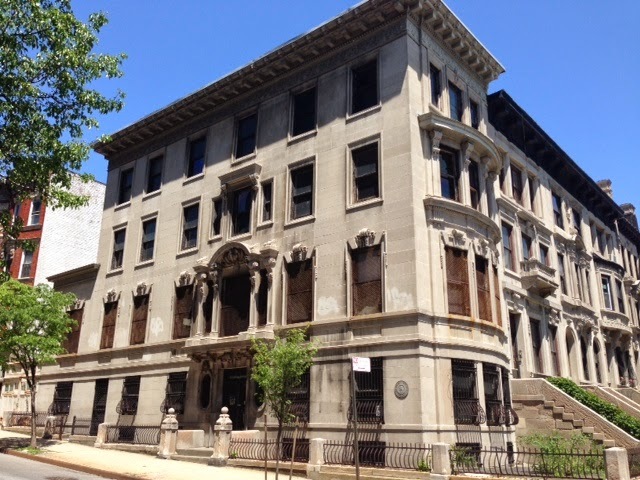 280 Convent Avenue became home to Frederick Robinson, the last of the City College Presidents to live here. Robinson’s presidency lasted from 1927 through 1938, after which the mansion’s glory days came to an end. For a while the house was used as a “student boarding house,” then became the headquarters of the Alumni Association around 1945. Named The Alumni House, it suffered use as offices and sleeping rooms for more than a decade. As the Alumni Association prepared to move to the fifth floor of the Finley Student Center in 1957, an historic treasure was uncovered in the attic. Townsend Harris had founded City College in 1847 and is credited as the diplomat who opened the Japanese Empire to foreign trade and culture. In December 1857 he marched 100 miles from the port village of Shimoda to Yedo (now Tokyo) to negotiate the first trade and amity treaty between the United States and the Japanese Empire. A flag bearer headed the procession carrying a 31-star American flag made of Japanese crepe. Townsend Harris brought the flag back with him to the United States in 1862 when he retired as consul general. It was eventually framed and hung in the Townsend Harris Hall High School, the preparatory school of City College. When the school was closed in 1942 the flag disappeared and was assumed lost. Then, on September 21, 1958, The New York Times reported “The first foreign flag raised in the city of Tokyo after the opening of Japan has been found in the attic of an old brownstone building at 280 Convent Avenue, just north of the City College campus.” As the Alumni Association emptied the attic, the framed flag was found hidden behind some dusty cabinets. The once-grand mansion now became something of a white elephant for City College. For a period it was used by the Hamilton Grange Conservation Office, and in 1968 became an incidental part of the anti-Vietnam protests. When potential employers arrived on campus in November that year, students whom The New York Times deemed “radical” were offended by the presence of representatives of General Dynamics, Hughes Aircraft, and other firms manufacturing war-related products. The protesters disrupted the scheduled interviews at the School of Engineering, resulting in about 600 engineering students pushing back. The mansion sat empty and neglected for the next four decades, suffering from fire and water damage. Then in 2013 City College announced plans to build a sleek three story addition as part of a conversion to the Colin Powell School for Civic and Global Leadership. Neighbors and preservationists were enraged. The Historic Districts Council called the proposed addition “out of character” with the district. 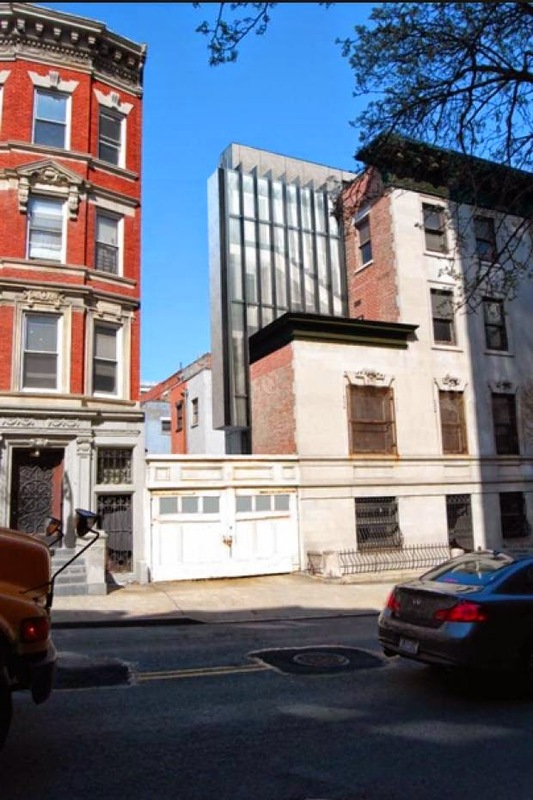 Much to the community’s dismay, the Landmarks Preservation Commission approved the ultra modern glass and metal addition. The Commissioners’ Plan of Manhattan’s that resulted in streets and avenues was published in 1811. Within the next two decades the country estates closest to the city would be criss-crossed with thoroughfares and, in most cases, their elegant villas demolished. But farther north the rural summer estates of the city’s wealthiest citizens would survive significantly longer. The Bloomingdale Road, later renamed Broadway, was the major artery for travelers. Dotted along it, roadhouses provided travelers rest and refreshment; while lanes and unpaved roads branched off toward the summer estates. Around the convergence of the Bloomingdale Road and Manhattan Street (approximately 125th Street today), a tiny village was laid out in 1806 by city surveyor Adolphus Loss. Called Manhattanville, it soon had a school and “house of entertainment," a market and a wharf. The rural village attracted tenant farmers and blue collar workers. A stage and a boat provided transportation for the eight mile trip to New York and before long a ferry to New Jersey was established. By 1823 there were about 15 homes in the village for its mostly poor residents. Although small, the population, augmented by the wealthy summertime residents, was large enough to warrant a house of worship. On Thanksgiving Day, December 18, 1823 Rev. William Richmond, the rector of St. Michael’s Church in the village of Bloomingdale held a worship service in the school house. He took the opportunity to invite residents to organize a proper church. 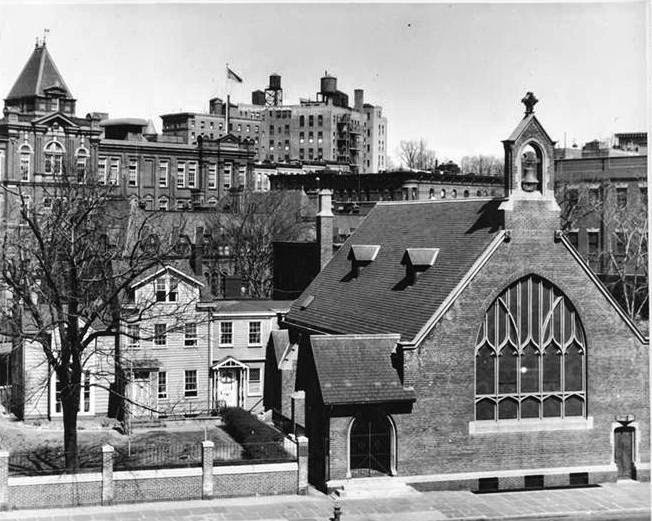 Although nearly all of the churches established in Manhattan's the rural north at the time were chapels of convenience—branches of established churches downtown—Richmond proposed an independent church and parish. Wealthy merchant Jacob Schieffelin donated a plot of land 60 by 100 feet on Lawrence Street for the new St. Mary’s Protestant Episcopal Church. The cornerstone was laid on June 15, 1824 and the little wooden structure was dedicated on October 23, 1826. Five years after its doors were opened St. Mary’s Church eliminated pew rent. What sounds like a forward-thinking and generous move was probably simply pragmatic. Although there were wealthy members; the majority of parishioners were poor and the pew rents were meager. Trustees finally decided to simply forgo the rents altogether. By the beginning of the 20th century Manhattanville was fully developed. The little wooden church on Lawrence Street was no longer adequate for the growing congregation. Although rector, the Rev. Hiram R. Hulse, pushed for a new building in the late 1890s, the project was delayed by a lack of funds. The periodical credited the design to “Architects Carrere & Hastings” and predicted it would be “an attractive structure of stone and brick.” The writer failed to name firm member Theodore E. Blake who was mainly responsible for the design. Built of red brick with stone detailing, its English Gothic design bore some striking similarities to Renwick & Sands’ 1868 Church of the Holy Sepulcher on East 74th Street. 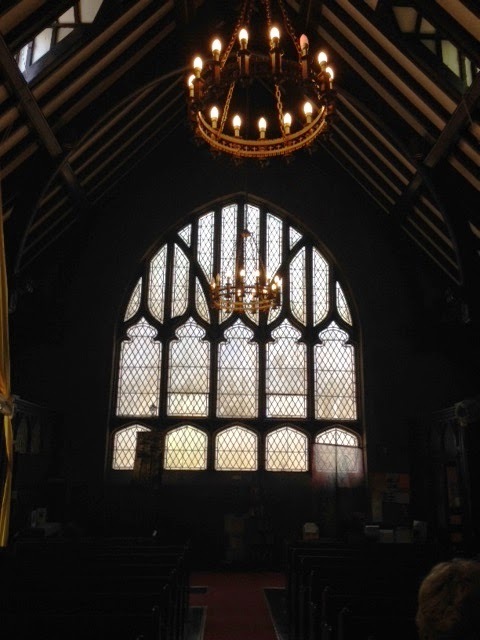 Blake’s structure, however, was dominated by the enormous Gothic arched window with its graceful tracery. Atop the gable sat a quaint open bell tower crowned by a Celtic cross. The bell from the original St. Mary’s hung in the tower. The side porch of the church was carefully erected over the burial vault of the Jacob Schieffelin family. Inside the architects carried out the rural ambiance with exposed beams and fretwork and unplastered brick walls. And yet the proportions of the space resulted in a melding of the charm with grandeur. The $35,000 cost would translate to about $856,000 today. 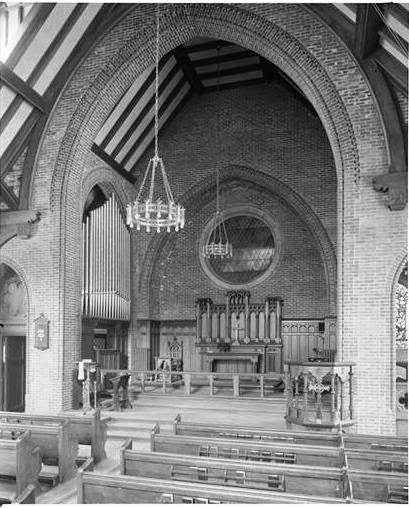 St. Mary’s Protestant Episcopal Church drew its choir partly from The Sheltering Arms. In 1912 the voices of twelve men and eight women were augmented by those of a dozen boys from that organization. Choirmaster T. B. Arden was secure in his choir’s supply of young voices—it was the grown-ups that were making him nervous. They were rampantly pairing off and getting married, threatening the continued existence of his group. The newspaper told readers that choir members Helen Belle and Frank Roe had been married in the church on the past Monday; and two days later soproano Mabel Quigley gave a party at her home to the choir members. “Under the ice cream plates were found cards announcing that she had been married to William C. Blockwood.” It was almost too much for the choirmaster to handle. The 1908 side windows hint at the Art Nouveau movement. Six years after Prohibition was enacted, a strong push for repeal swept the nation. Many of those who believed that the outlawing of alcohol would reduce taxes and better the quality of life now recognized that there was a downside. Organized crime was rampant; hundreds of millions of federal tax revenue was lost; while millions were being spent on Prohibition enforcement. Charles Breck Ackley, pastor of St. Mary’s, however, was unmoved. On November 1, 1926 he stood before his congregation and addressed the growing pressure for repeal. He argued that six years was not long enough for Prohibition to prove itself. Ackley was not the first and certainly not the last rector of St. Mary’s unafraid to voice his opinion. One of the most outspoken would be the Rev. Robert W. Castle, Jr. who took the pulpit in 1987. By now Lawrence Street had become West 126th Street and the congregation was largely black and Hispanic. Father Castle’s ministry was as much about social outreach as spiritual preaching. He had marched alongside Dr. Martin Luther King, Jr. and picketed businesses that refused to hire minorities. Among his first actions as rector was to bring in a Spanish-speaking priest so neighbors could hear mass in their language. When the nearby Cathedral of St. John the Divine held a service honoring General Colin L. Powell and other Operation Desert Storm participants, Castle was out front with the protesters. 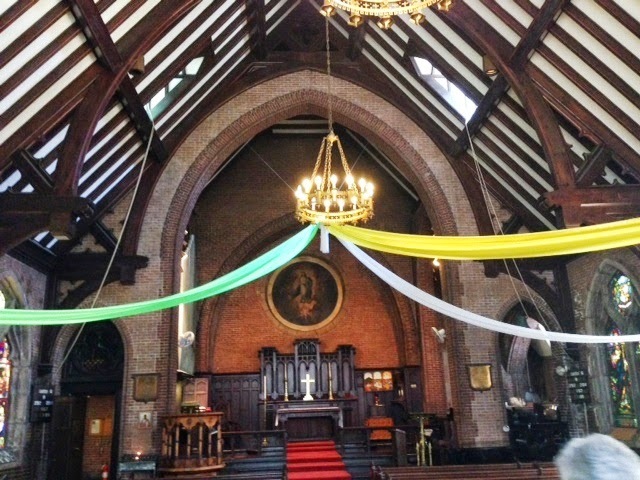 A 2014 occasion prompted streamers in the timbered sanctuary. Father Robert Castle retired in 2000 but his legacy continues on West 126th Street. 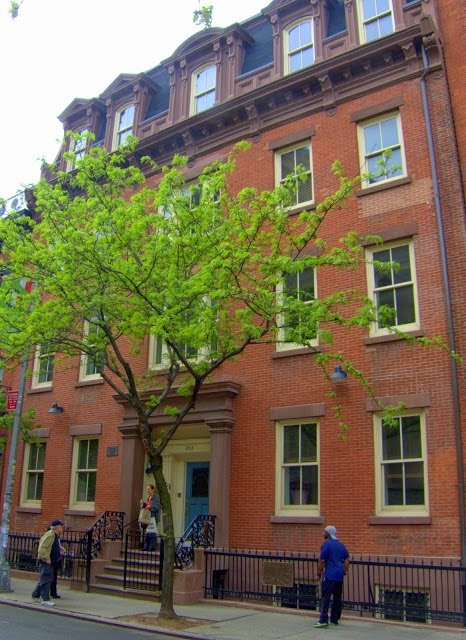 Under his direction the St. Mary’s Episcopal Center was established across the street from the church; a residence and day treatment center for people living with HIV/AIDS. The church continues to reach out to the homeless and needy and runs a “supermarket style” Food Pantry and a mobile soup kitchen. Theodore Blake’s 1908 brick and stone jewel is virtually unchanged and meticulously maintained. 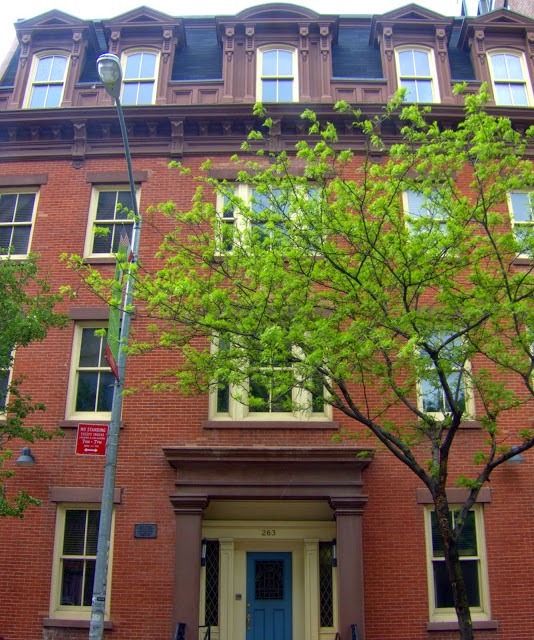 In 1851 as the expanding upscale residential neighborhood of Fifth Avenue spilled onto the side streets, attorney John Latson moved into his new home at No. 44 West 22nd Street. The substantial 3-story, 23-foot wide home reflected Latson’s social and financial status. Politically active, he ran for Trustee of Schools that same year and his name regularly appeared in newspaper articles on court cases or political issues. It seems that Latson approached the men’s furnishings shop, asking for uniforms to be made and promising “he had full authority to draw upon the Government for all the goods he wanted, and no other Colonel had been similarly favored.” When the clothiers asked for proof, he sadly admitted he had left his documents at home. Although Bonnell had the uniforms delivered to Camp Low, Staten Island; his repeated efforts to get proof of Latson’s connection with the Government landed forced him to take the attorney to court. The once-respected lawyer was exposed as a sham. 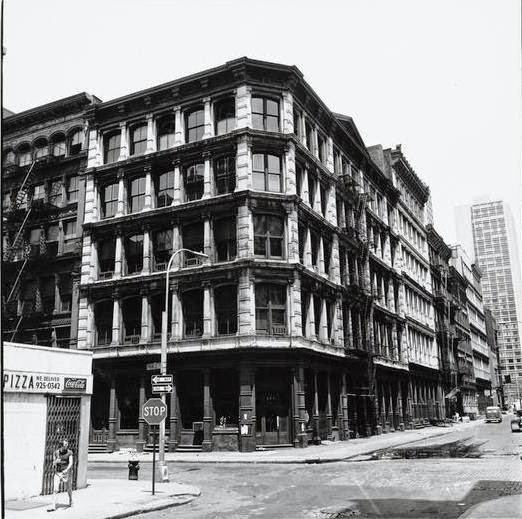 In the 1870s, as Sixth Avenue just around the corner began filling with the retail establishments that would form The Ladies’ Mile, Cambridge Livingston lived in the house. For years the respected gentleman served as Treasurer of the Joint Committee on Ecclesiastical Relations and Religious Reform. The change in the neighborhood was evident in 1889 when Elizabeth T. Belt was living here and applied for a $27,500 mortgage. She then received a second mortgage of $4,500 and then a third of $2,150. In 1891 she transferred the debt-ridden house to her daughter, Elizabeth M. Delabarre. The end of the road for the once-elegant home was nearing. Elizabeth Belt had married Walter E. Delabarre on December 23, 1889 and the couple lived at Asbury Park, New Jersey. Perhaps her mother was prompted to give her the 22nd Street house by Elizabeth’s desertion of her husband, as alleged by Walter Delabarre’s divorce complaint. Or perhaps she simply wanted out from under its financial burden. At any rate, Elizabeth Delabarre was living on West 22nd Street by May 1890—less than six months after her wedding. And she was as cash-strapped as her mother. In May 1890 Elizabeth borrowed $500 (about $12,500 today) from Louis Silverman, a professional lender. As guarantee, she gave him a “chattel mortgage” on her furniture and promised to pay four monthly installments of $175 each. The following month she borrowed another $5,000, agreeing to pay a hefty $1,750 commission. Having lost her furniture, Elizabeth Delebarre somewhat surprisingly sued Silverman for usurious conduct. Simultaneously, the crafty woman deeded the house to Hamilton H. Salmon “for the consideration of $3,100,” according to The New York State Reporter. The agreement was that when she repaid that amount, Salmon would reconvey the premises to Elizabeth. She then duplicated the deal, deeding the house to James W. Purdy, Jr. for $1,100. A distinct problem arose when Elizabeth Delebarre was unable to pay either of the loans--just as she was unable to pay Louis Silverman. When Hamilton Salmon and James Purdy discovered that they both held deeds to the same property, the tangled web landed Elizabeth Delebarre back in court in November 1892. By now Elizabeth was no longer in her furniture-bare residence. It was briefly home to Mrs. Margaret M. Barnard, the widow of the former President of Columbia College. The sumptuous rooms once again were filled with fine paintings and costly furniture. But Mrs. Barnard died within a few months of moving in and March 17, 1892 an auction of the Barnard furnishings was held in the house. Also included in the auctioned items were a chair dating to 1686 and a 1649 desk. A block away, West 23rd Street had become the artistic center of New York City outside of Greenwich Village. Four years earlier the Artist-Artisan Institute Building had been completed at Nos. 136-140 West 23rd. The School for Applied Design for Women opened at the corner of 23rd Street and Seventh Avenue; the Associated Artists was at No. 115 East 23rd Street the School for Industrial Art and Technical Design for Women shared space with the Artist-Artisan Institute. No. 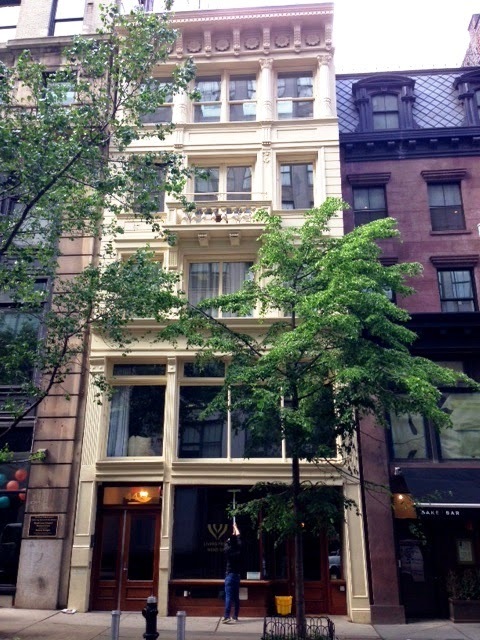 44 West 22nd Street was now owned by Mrs. E. J. Robinson, and she recognized that the upscale residential days of the block were over. She commissioned the esteemed architectural firm of DeLemos & Cordes to transform her old brownstone into a modern structure for artists’ studios. Completed in 1893, the makeover was remarkable. 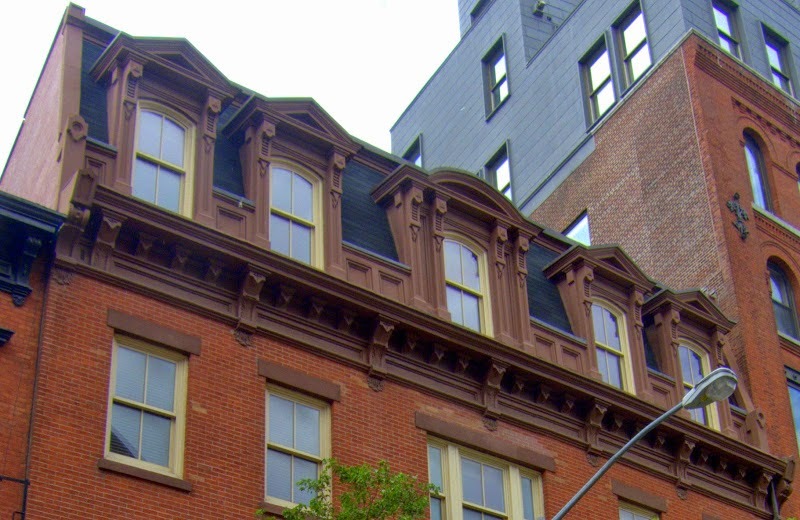 The architects removed the brownstone front and installed a cast iron Beaux Arts façade pulled forward nearly to the property line; and the structure was raised to five stories. The pre-Civil War interiors—carved newel posts, marble mantels and intricate plasterwork on the ceilings—were gutted for light-flooded, modern spaces. An eye-catching balcony embellished the fourth floor. A picturesque cast iron balcony, engaged Corinthian columns, and full-relief sunflowers between the cornice brackets enhanced the visual appeal. 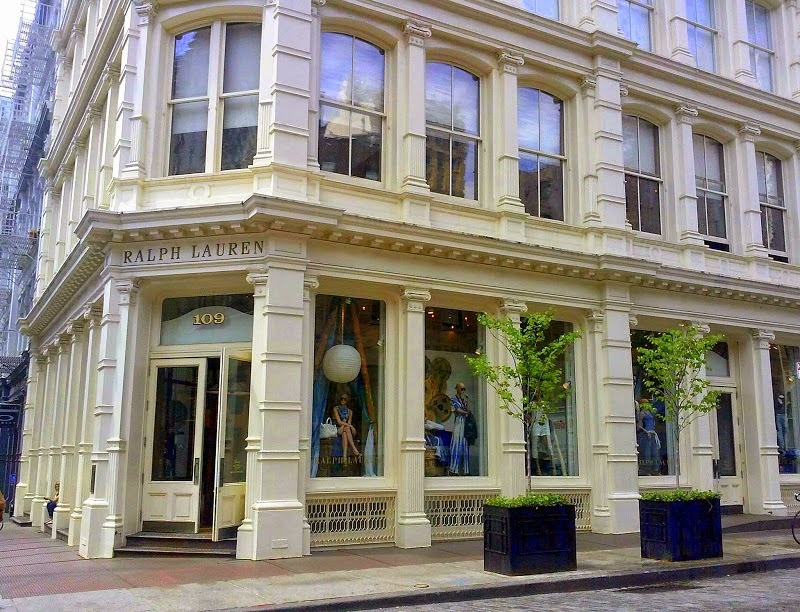 While the completed building filled with artists; at least one apparel company moved in—a hint at the coming incursion of the Garment District. In 1894 Julius S. Stern was here, importing and manufacturing dress trimmings. Among the first artists in residence was Roswell M. Shurtleff. A member of the American Water Color Society, he was also a member of the New York Zoological Society. Shurtleff kept a small house on the edge of the Adirondacks in the Keene Valley where he spend much time painting mountain and forest scenes. The last trace of the block's residential days survives next door at No. 46. 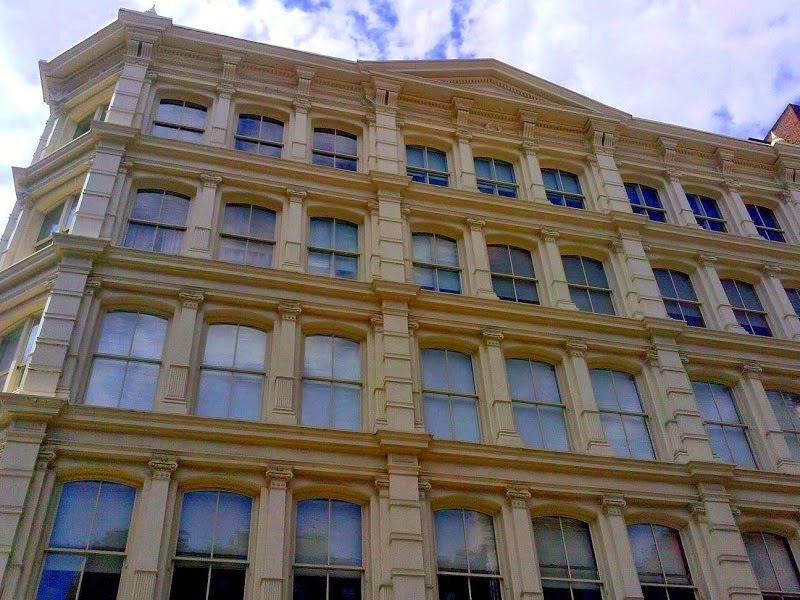 The brownstone facade is intact above a commercial remake of the lower floors. By 1906 Shurtleff was represented in the Metropolitan Museum of Art, the Springfield Art Museum and in the Smith College collection. He earned a bronze medal at the 1901 Pan-American Exposition in Buffalo, and another at the Universal Exposition in 1904 in St. Louis. He would stay on in the 22nd Street studio at least through 1907. But the years as an artists’ studio building would not last long. 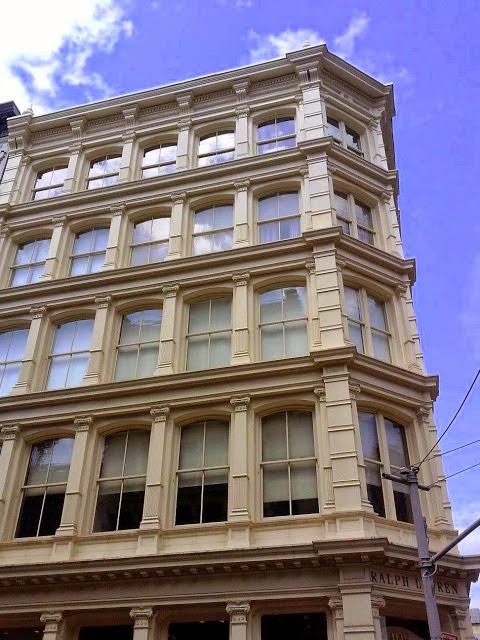 In January 1909 owner John L. Tonnelle leased “the first loft” to Frederick W. Patten. Already Fanny Young’s Baby Shop had opened in the street level retail shop and before long the upper floors were home to embroiderers, dressmakers and corset manufacturers. 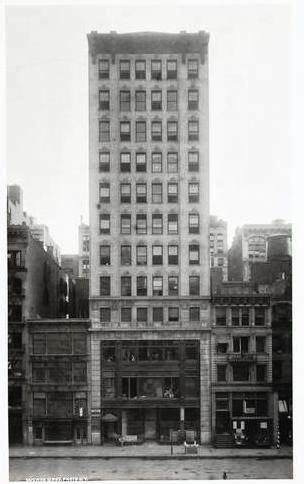 Fifty-year old William I. Gottlieb’s dressing making company, Gottlieb & Rabinowitz, was in the building in 1923 when tragedy struck. In July Mrs. Gottlieb had gone off to the country, leaving William at home. At around 8:00 in the morning on July 29 he drove his Cadillac sedan to the home of 20-year old Gladys Miller, an actress. It was Gladys’ birthday. Gladys and her sister, 18-year old Thelma (also an actress), climbed into the Cadillac with the intentions of celebrating Gladys’ birthday. By mid afternoon Gottlieb and the Miller sisters had invited Verna Tolley and Mae Lewis to join the party. The four young girls and the middle-aged married man headed off to Long Island, supposedly to Long Beach. At 2:19 a.m. the five were still strong, speeding along through a pelting rainstorm. A witness saw the Gottlieb car speeding past the dropping railroad barricades with their glowing red lanterns. Within seconds a locomotive crashed into the Cadillac, “and for 1,200 feet the train went on, gradually grinding down to a stop,” reported The Times. All five passengers were killed. The early modernization of the lower two floors did not negatively effect the DeLemos & Cordes design. As the Garment District moved northward into the 30s, the lofts in the West 22nd Street building were taken by a variety of small businesses, including the Cameo Novelty Company in 1946. Then, with the rediscovery of The Ladies’ Mile at the turn of the 21st century, No. 44 received a major renovation. In 2007 it was converted to commodious apartments—two per floor on the lower floors and a luxurious duplex on the top two floors. The handsome cast iron façade still garners attention on the quiet side street; offering little hint at the widely-varied history that played out inside during its more than 160 years of existence. The Catholic Church in Manhattan got off to a rocky start. During British rule Catholic worship was prohibited by law. Then, in 1785, almost immediately after the British left, St. Peter’s Church was founded and a Georgian-style church was built on Barclay Street—three years before the Washington took office. The Roman Catholic population continued to grow and on April 8, 1808 the diocese of New York was created (covering all of New York State, New Jersey, and several Long Island counties). Within the year French-born architect Joseph-Francois Mangin was commissioned to design the first Catholic cathedral in American—St. Patrick’s. The architect had recently completed the design of City Hall in conjunction with John McComb, Jr. 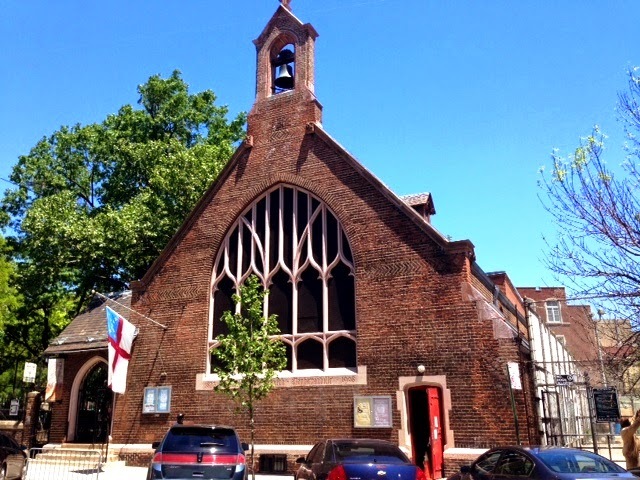 The completed church on Mulberry Street near the corner of Prince Street was dedicated six years later on May 14, 1815. But the presence of a cathedral and a bishop did not mean that Catholics were warmly accepted. In 1834 the Board of Trustees resolved “that a wall shall be built around the Cathedral and churchyard" to protect both the graveyard and the church from rioters bent on destruction. The decision proved to be wise move. Ten years later the church was besieged by a violent mob of anti-Catholic and anti-Irish rabble intent on torching the cathedral. The bishop at the time was the dynamic 47-year old John Joseph Hughes. He assembled parishioners and members of the Ancient Order of Hibernians behind the wall. 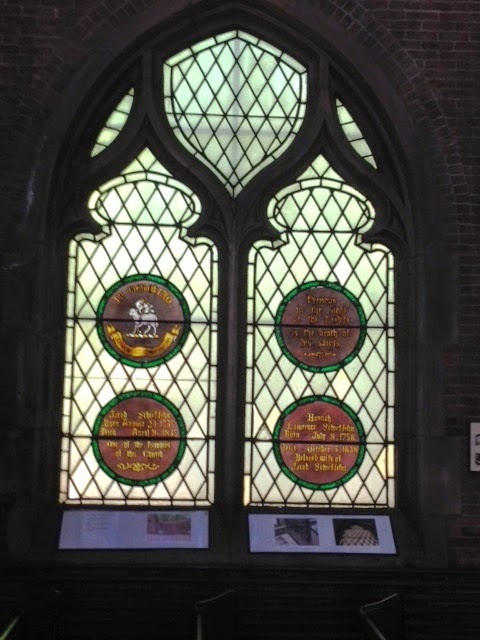 The defenders punched holes in the wall for their muskets and fought back the mob which was chanting “paddies of the Pope.” Although the Catholics held off the rabble; several of the fine windows of the church were smashed in the melee. Bishop Hughes fired off a letter to Mayor James Harper threatening “Should one Catholic come to harm, or should one Catholic business be molested, we shall turn this city into a second Moscow," referring to Napoleon's somewhat recent siege of that city. The Irish-born Hughes had been made bishop in 1842, succeeding John Dubois. It was apparently during his term that the imposing Rectory was constructed directly across from the Cathedral. Five bays wide, the handsome Greek Revival structure encompassed two wide building lots. Constructed of red brick with brownstone trim, it was home not only to the bishop; but to the parish priests—as many of seven at some times. John J. Hughes was elevated to Archbishop when New York was made an Archdiocese by Pope Pius IX in 1850. At the time St. Patrick’s Cathedral was the largest church in Manhattan. But Hughes had bigger plans. In 1852 the Archdiocese purchased the block of land far north on Fifth Avenue at 50th Street. The plot was so far removed from the established city that critics called the project “Hughes’ Folly.” The cornerstone was laid on August 15, 1858 and the immense white marble cathedral began rising. Then, in 1861, Civil War broke out. One by one construction workers marched off to war until eventually work on the Cathedral stopped completely. Three years later Archbishop John Hughes died, never to see his magnificent church completed. John Cardinal McCloskey moved into the Rectory as the new Archbishop. Although the new St. Patrick’s Cathedral would not be officially dedicated until 1879; Archbishop McCloskey left the old Mulberry Street rectory by 1875 and took up residence in the Archbishop’s mansion at No. 218 Madison Avenue. It was there, on March 16, 1875, that he received the telegram informing him that he had been elevated to cardinal—the first in America. A month later, John McCloskey received his cardinal’s hat in the parlor of the old Rectory. Later he would repeat the ceremony across the street in the old Cathedral. Now, the Very Rev. William Quinn who had been vicar-general at the old Cathedral moved to the new St. Patrick’s; leaving Father Kearney as rector of the Mulberry Street church. The priest took over the parish at a time of noticeable change in the neighborhood. While the original parishioners in the cathedral had been almost exclusively Irish; now waves of Italian immigrants filled the streets. Later Father Kearney would remember “The changes in population came on gradually, but I should say that in 1873 the first large Italian immigration began. There had been hard times in Italy and thousands came over here in search of work. Again in 1882 there was an especially large number of them.” Because he spoke Italian, Father Kearney was able to reach out to the Italian Catholic population. In the first years of the 20th century New York City was plagued with anarchist terrorists, including the Black Hand. The Italian group was responsible for assassinations, extortion and bombings. Police Lieutenant Joseph Petrosino was working in Italy in 1909 when he was gunned down by the Black Hand. His body was returned to New York and his funeral took place in Old St. Patrick’s. An estimated 10,000 mourners were present at Mgr. Kearney’s funeral. The former Bishop’s residence and Rectory drew little attention to itself over the years. In May 1939 when Old St. Patrick’s celebrated its 130th Anniversary, a “colorful procession” started at the Rectory and wound around the streets before returning to the old church. And in 1950 Cardinal Francis Joseph Spellman chose the Rectory to despair over the failure of continued peace after the end of World War II. Today the dignified old structure, still used as the Old St. Patrick’s Rectory, is lovingly maintained and beautifully intact. As the sons of Manhattan millionaires grew to manhood, membership in at least one—but preferably several—of the exclusive men’s clubs was expected. Passing the rigid selection process proved one's good breeding and social status; but most of all money. None of those qualifications mattered much, however, if the man were Jewish. Manhattan society was, for the most part, made up of Episcopalians with some ultra-wealthy Roman Catholics tolerated (although not in the ballroom of Caroline Schermerhorn Astor). Despite the staggering wealth of some Jewish families, only a handful of Jews would manage to wrest memberships in the highly-exclusive Union or Metropolitan Club, for instance. And so they established their own private club. The Progress Club was founded in 1864 and quickly developed a high-class standing. The New York Times later said, “In Hebrew society the Progress Club has the same standing as the Metropolitan in other circles.” By the 1880s it had established itself in a clubhouse at No. 110-112 East 59th Street at the corner of Park Avenue. But that would quickly change. 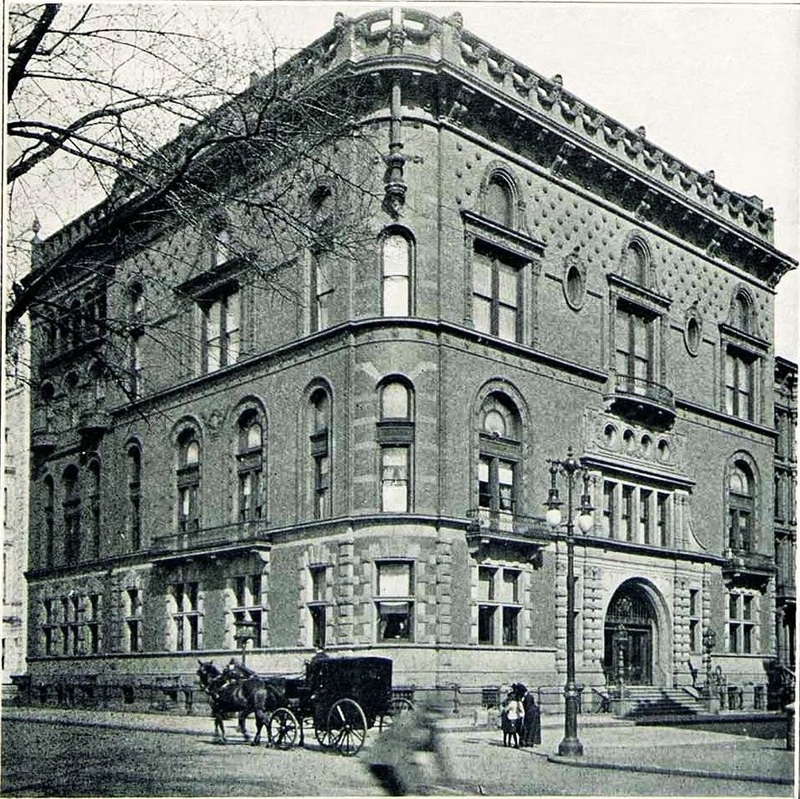 On July 28, 1887 the members sold its building for $105,000 and spent double that amount--$235,000 to be exact—on the 100-square foot corner lot on Fifth Avenue at 63rd Street. Newspapers reported that plans were being prepared for “a $250,000 clubhouse” directly in the center of the developing mansion district. The total proposed outlay of $485,000 would amount to a jaw-dropping $11.5 million today. Alfred Zucker was born in Freiburg, Silesia in 1852 and had settled in New York in 1883. 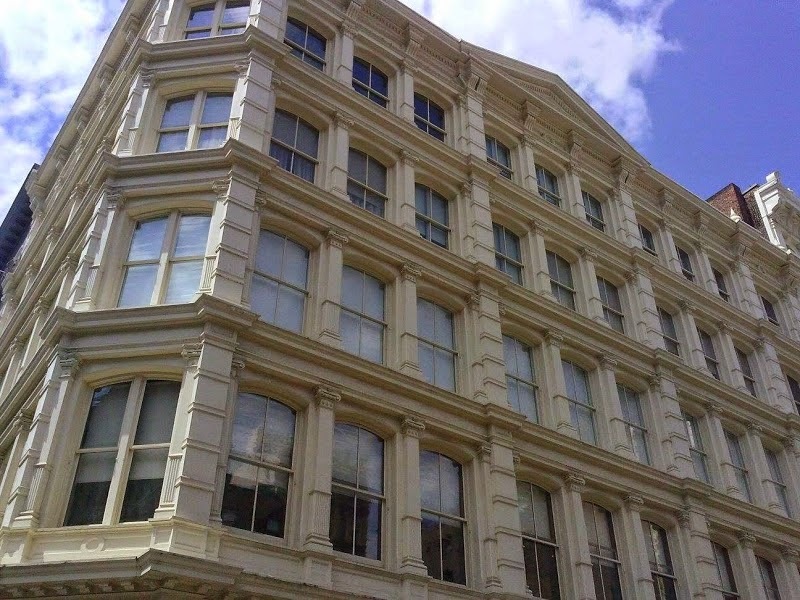 He busied himself designing cast iron loft buildings in the area now known as Soho. Now the Progress Club chose the Jewish architect to design their new home. By now the cost of the structure, excluding the plot, had doubled to $500,000. 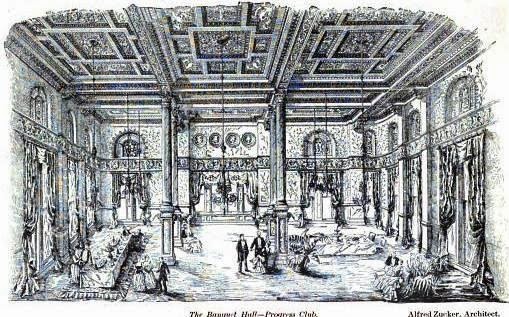 The members of what newspapers routinely called the “Hebrew club” seemed determined to match or outdo the most lavish of Manhattan’s clubhouses. Five months later the Progress Club hosted its last function in the old clubhouse. Among the entertainments were a children’s production of A Midsummer’s Night’s Dream, and “as an interlude Miss Nellie Williams sang ‘Dere ain’t no Flies on Me,’ for which she was rewarded with loud applause,” reported The Times the following day. It was announced that the club would be in its new Fifth Avenue clubhouse by the opening of the social season. It pointed out the costly finishes: “the wealth of highly carved wood; wrought iron and brass; the great stained glass windows, one of which is 22x30 feet; the lavish use of onyx, serpentine and other semi-precious stones, the large picture ceilings, the ivory enameled walls, the superb hangings in coral plush and Etruscan gold.” Everything—without exception—in the new building was custom built to the designs of Zucker. The furniture, the draperies, carpets, chandeliers, even the candelabra, were manufactured according to the architect's drawings. 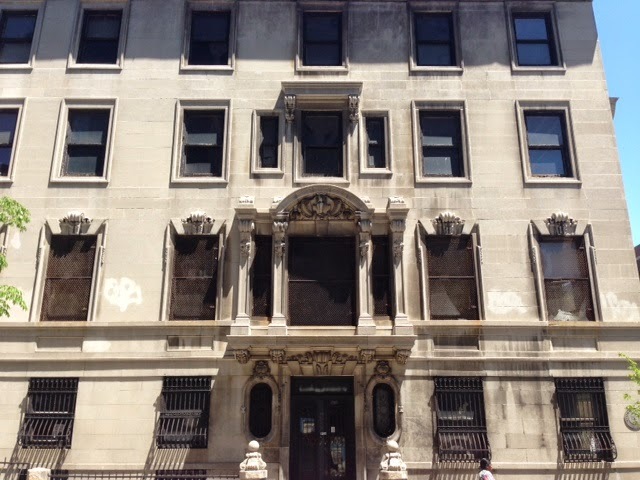 Members entered through a great arch on 63rd Street into a marble-walled vestibule. At the end of the vestibule was the grand staircase, dominated by a 22-foot high stained glass window at the landing. Downstairs were the oak-furnished reading room with leather-covered walls and wrought iron chandeliers; and two drawing rooms. One of these was “First Empire” in style. It dazzled with onyx columns with gold capitals. On this floor, too, were the reception room, steward’s office and coat room, and an oaken dining room. At the second landing was an even larger stained glass window—30 feet high by 22 feet wide—depicting Progress ascending amid clouds. The magnificent banqueting hall fully engulfed half of the second floor. At 90 feet long, 55 feet wide and 25 feet high, the Record deemed it “one of the noblest apartments in the city.” The onyx columns with gold capitals upholding the ceiling sat on pedestals of malachite. The ceiling was divided into nine large panels, from each of which were suspended silver chandeliers. They were matched by silver sconces on the walls. In this room was a musicians’ gallery of ormolu gilt. 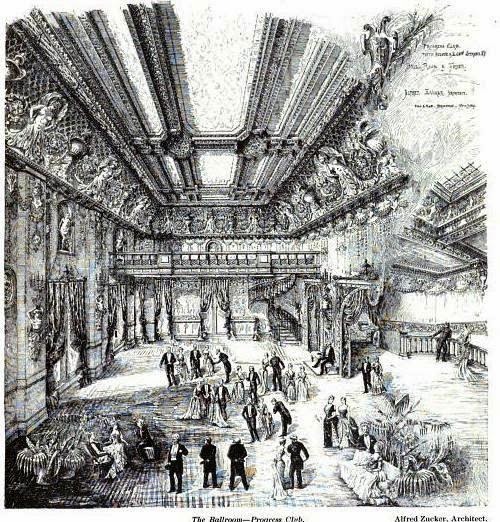 Zucker’s over-the-top décor in the ballroom included female figures crafted of onyx and ormolu holding the golden candelabra, and nymphs supporting chains that held back the draperies. In the cove of the ceiling huge winged female figures wore tiaras of electric lights. More than 1,000 persons could comfortably fit into the ballroom. Also on this floor were the “dainty ladies’ drawing-room” in white and gold Rococo. The ceiling was painted with a reproduction of Thuman’s “Amor and Psyche.” On the opposite side of a foyer was the gentleman’s room. These spaces were designed so that on grand occasions the entire floor could be opened into one large entertainment area. Below ground were six bowling alleys, wine cellars, billiard room and café; as well as the expected kitchens, larders and mechanical rooms. The critics from The Times and the Record & Builders’ Guide were just two of 1,500 persons at the housewarming. 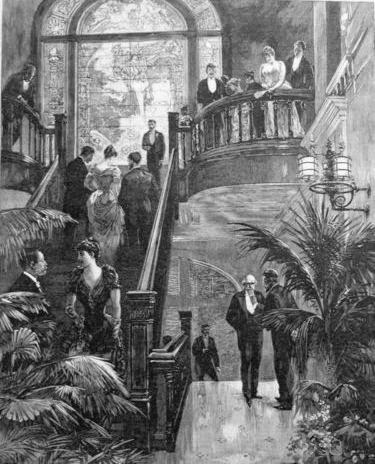 Among the guests who mingled among the potted ferns and palms that night were names like Rothschild, Bloomingdale, Blumenthal, and Stein; some of the wealthiest merchants and bankers of the city. Mayor Hugh J. Grant, Governor David B. Hill and Board of Alderman President Arnold were all invited; but their names did not show up on the list of attendees. Like every other high-end men’s club in the city, the Progress Club was not without its internal politics and dissension. During the last week of January 1894 the club staged “a vaudeville entertainment which was being given by the club to its feminine guests,” as reported in The New York Times a week later. There was a long-standing rule that whenever women were invited into the clubhouse, smoking in certain rooms was prohibited. That evening when J. Murray Danenbaum entered a supper room as the entertainment was going on, he noticed a member “enjoying a prohibited cigar.” Indignant on the part of the women in the room, Danenbaum approached the member and rather sternly reminded him of the rule. The New York Times said “The offending member, unmindful of the soft answer that turneth away wrath, answered in kind and smoked on.” It was the beginning of a problem far worse than the offending cigar. Danenbaum plucked the cigar from the man’s mouth and flung it to the floor. If female guests were put off by the stench of cigar smoke in the supper room; they were no doubt terrorized by the pugilistic threats that were now exchanged by the two men. Only the intervention of cooler minds prevented a full-out fist fight, according to reports. 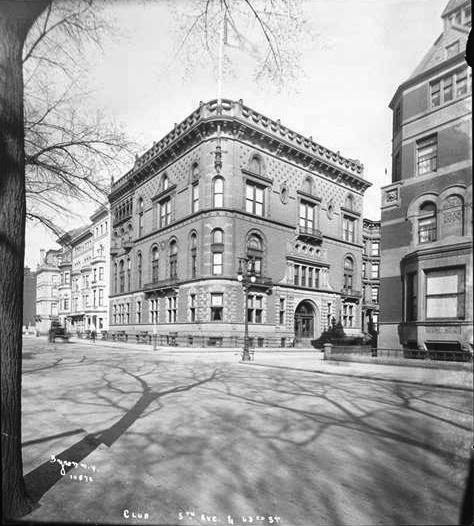 It took the club over a year to find a suitable property; but on November 3, 1901 it announced the purchase of three lots at the northwest corner of Central Park West and 88th Street. 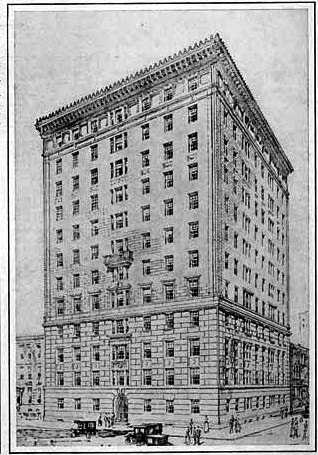 Simultaneously it was revealed that millionaire James B. Haggin had signed a contract for the purchase of the 63rd Street building. “The reported price in the sale to Mr. Haggin was $735,000, and he will put up a mansion on the site costing about $1,000,000,” reported The New York Times. The Progress Club moved to the West Side and, oddly enough, James B. Haggin did not build his new mansion; but let the hulking clubhouse sit empty and dark. 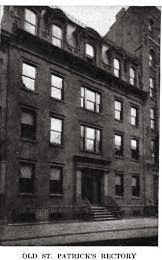 Instead, he moved into the lavish Crocker mansion one block north at the corner of Fifth Avenue and 64th Street in 1912. The firm of Starrett & Van Vleck was commissioned to design the 12-story Renaissance-inspired building. With one apartment per floor, the new building was marketing what could be termed horizontal mansions. The rents were expected to be about $18,000 to $25,000 per year—about $47,000 a month in today’s dollars for the more expensive apartments. Before the massive apartment building could rise, the Progress Club had to come down. The lavish interiors of onyx columns and ormolu galleries were gone within weeks. That it ever stood is largely forgotten.